Doesn't this just look delectable?? This Valentine's Day weekend I had a SPECTACULAR dinner made by the Fabulous Mr. Dish. Now, there is COOKING, and then there is the ART of cooking. This meal was MOMA material. To be honest, I don't remember the name of a single thing I ate; but I can tell you that I was beyond tempted to lick my plate. And the table decor? Yeah, that was the Fabulous Mrs. Dish. 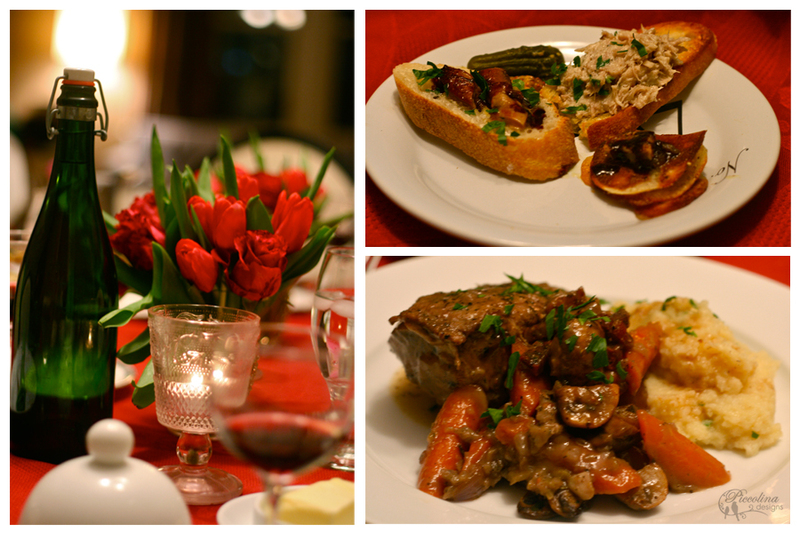 Tulips & roses, candles and crimson linens, French cuisine... Husband and I had a spectacular evening with spectacular friends. All of which, but me, have the ability to cook. Confession: I am an ABYSMAL cook. I routinely microwave leftovers to a rubbery food-looking inedible mess. The oven and I have a little arrangement: As long as I clean it and otherwise leave it alone, it won't set off the smoke alarm on me. A year into our relationship, I thought it would be a good idea to invite my now-husband over for a homemade meal- even though I was fully aware of my cooking abilities. I chose what seemed to be a simple cheesy chicken and rice dish and that evening he arrived to find a decorated table and dinner presented nicely on plates. We sat down to eat and as he put that first bite in his mouth I heard a loud CRUNCH. In all my cooking wisdom, I purchased the non-minute rice. As the cheesy chicken sauce was blended with the rice, this was not an easy fix. My poor date spent over an hour trying to salvage my disastrous cooking venture. Finally he turned to me, laughed, gave me a big hug, and said, "How about I order us a pizza?" Bless his heart, nine years later, he still hides his trepidation every time I get that urge to cook something in the kitchen. This is an adorable story. Probably like it so much because I have done the same exact thing with regular rice. You are right-it is hard to fix rice that is still hard in the center! So sweet that you all have been together 9 years. We just celebrated our 10th anniversary at the beginning of the year.